Today was my first Dawn Parade. I have said for a while it was something that I should do. After all, if a significant number of Australian and New Zealand service people can give their lives, the very least I can do is get out of bed at 4:15am to show my respect. I was absolutely overwhelmed by the number of people who did the same. The grassed area around Melbourne’s Shrine of Remembrance was simply a sea of people. Unlike many situations where so many people are gathered, the proper feeling of solemness and respect prevailed. It was a simple service, with just an appropriate amount of ceremony that failed to impose on the opportunity to reflect. The dawn light silhouetted the participants in a very moving manner. I went for a stroll around the Shrine afterwards – these are the pick of the photos. Lest We Forget! When it goes bad for Qantas, it goes bad big time. 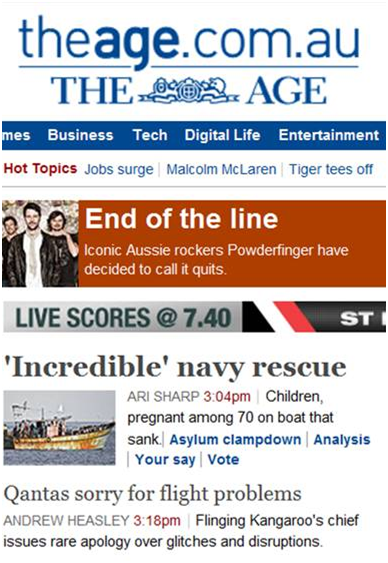 This is how The Age described the airline online, prior to it being corrected soon after. I thought this was a great article by Greg Baum in The Age this morning, on the state of the Australian Grand Prix in Melbourne. If Sydney wants it, let them have it I say.